A professional soprano soloist, Nicola-Jane teaches choral scholars at Clare College, Cambridge University, and in 2015 was made Head of Singing at Eton College with responsibility for individual lessons and choir coaching. 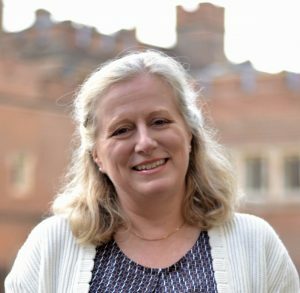 She is a Grade and Diploma examiner for the ABRSM, and a vocal and choir adjudicator for the British and International Federation of Festivals; she also teaches for the National Youth Choirs of Great Britain and Eton Choral Courses. She taught for many years at St Paul’s Girls’ School – a centre of excellence for LCM Music Theatre Exams – and is co-editor with Heidi Pegler of the award-winning series The Language of Song (Faber Music), which provides a resource for students and teachers learning to sing in foreign languages (now also available on the TiDo app). She organises masterclasses and a solo singing competition at Clare College, Cambridge, and sits on the council of the Association of Teachers of Singing. She was the Communications Director for AOTOS before becoming Chair Elect in July 2018.